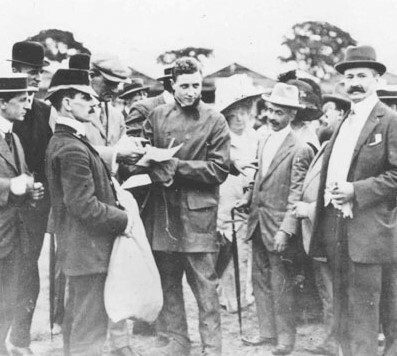 In 1912, my Uncle Billy Steel from Penrith took me to see Gustav Hamel giving a flying exhibition at Carlisle Racecourse. We went over by train from Newcastle and got a bus from Brampton. You paid half a crown to get in. That would be about from £5.50 in today’s money. 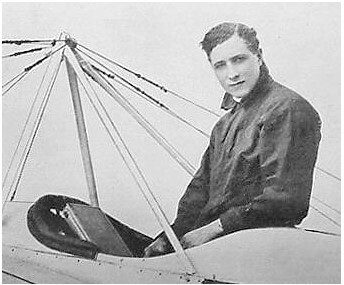 Gustav flew a Bleriot Monoplane. It was fitted with a 50hp Gnome Engine. For six pence you could enter the flying enclosure where the planes were grounded. They were held down with ropes in case they were flipped over by the wind; they were flimsy affairs, just string and paper. More like a kite. This Monoplane could attain a speed of 65mph. Gustav crossed the Channel eleven times, which didn’t count for much if you weren’t the first, but he was the first over with a lady passenger. He also held the record for flying to a height of 11,500 feet. I remember him arriving in a chain-driven red two-seater Mercedes sports car. There was a girl in the front seat waving a hat; that was his youngest sister Annie I believe. He put his flying gear on, clambered into this Monoplane and went up. He did one circle and down. That was it the first time. There was a near riot. But it the wind was getting up and he understood the risks. It was a couple of hours more before he risked his arm again. 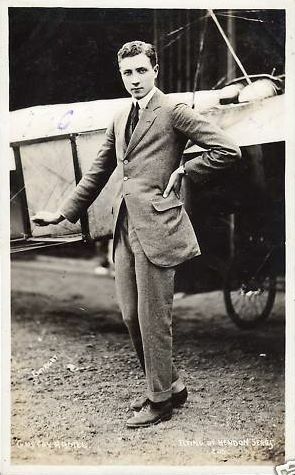 This second time he banked the machine, did vol-planes and pan-cake descents which everyone thought was a mistake … it was extremely thrilling. That’s how Billy and me got the bug. We bought these model planes as well left and flew them down the bank at the Spa. They thought he was a spy for the Germans. He was eventually lost over the North Sea.